Edited by Thomas K. Srull, Robert S. Wyer, Jr. If there is one topic on which we all are experts, it is ourselves. Psychologists depend upon this expertise, as asking people questions about themselves is an important means by which they gather the data that provide much of the evidence for psychological theory. Personal recollections play an important role in clinical theorizing; people's thoughts, feelings, and beliefs provide the principal data for attitudinal research; and judgments of one's traits and descriptions of one's goals and motivations are essential for the study of personality. Yet despite their long dependence on self-report data, psychologists know very little about this basic resource and the processes that govern it. In spite of the importance of the self as a concept in psychology, virtually no empirically-tested representational models of self-knowledge can be found. Recently, however, several theoretical accounts of the representation of self-knowledge have been proposed. These models have been concerned primarily with the factors underlying a particular type of self knowledge -- our trait conceptions of ourselves. The models all share the starting assumption that the source of our knowledge of the traits that describe us is memory for our past behavior. The lead article in this volume reviews the available models of the processes underlying trait self-descriptiveness judgments. Although these models appear quite different in their basic representational assumptions, exemplar and abstraction models sometimes are difficult to distinguish experimentally. Presenting a series of studies using several new techniques which the authors believe are effective for assessing whether people recruit specific exemplars or abstract trait summaries when making trait judgments about themselves, they conclude that specific behavioral exemplars play a far smaller role in the representation of trait knowledge than previously has been assumed. Finally, the limitations of social cognition paradigms as methods for studying the representation of long-term social knowledge are discussed, and the implications of the research for both existing and future social psychological research are explored. Contents: S.B. 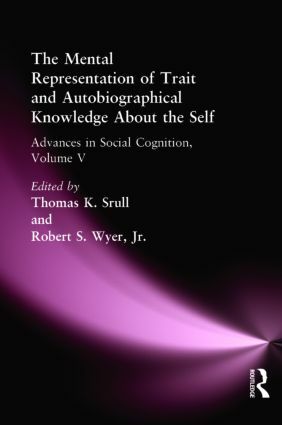 Klein, J. Loftus, The Mental Representation of Trait and Autobiographical Knowledge About the Self. F.S. Bellezza, Does "Perplexing" Describe the Self-Reference Effect? Yes! N.R. Brown, Response Times, Retrieval Strategies, and the Investigation of Autobiographical Memory. J.M. Keenan, An Exemplar Model Can Explain Klein and Loftus' Results. J.F. Kihlstrom, What Does the Self Look Like? C.G. Lord, The "Social Self" Component of Trait Knowledge About the Self. R.H. Maki, A.K. Carlson, Knowledge of the Self: Is It Special? K. Nelson, Developing Self-Knowledge from Autobiographical Memory. D.J. Schneider, H.L. Roediger, M. Khan, Diverse Ways of Accessing Self-Knowledge: Comment on Klein and Loftus. C. Sedikides, In Defense of Behavioral-Level Accessing and Use of Self-Knowledge. E. Tulving, Self-Knowledge of an Amnesic Individual is Represented Abstractly. J.D. Vorauer, M. Ross, Exploring the Nature and Implications of Functional Independence: Do Mental Representations of the Self Become Independent of Their Bases? S.B. Klein, J. Loftus, Some Lingering Self-Doubts: Reply to Commentaries.